2019 LONE STAR PREVIEW EVENT REGISTRATION IS OPEN! Thank you for your interest in 2019 Lone Star Preview. Entry Fee: The entry fee for the Lone Star Preview marching band championship is $500 and is payable to TWHS Band Boosters. TWHS Band Boosters will accept a school or booster club check, money order, or school purchase order (see entry form at “Register for Lone Star Preview” link above). Entries will be accepted via the online registration form beginning April 5, 2019 at 8:00 AM CT through August 31, 2019. The online entry form must be completed in full by the unit director. Entry form and fee must be received by August 31, 2019 for the entry to be valid. The performance schedule will be determined by time stamp of entry beginning NO EARLIER than 8am on Friday, April 5th, 2019. Eligibility: Eligibility is open to all high school bands. All participating members must be enrolled at the same high school as full-time students, or at the feeder school of the participating high school. All performers who contribute to the performance must be students. Violation of the eligibility guidelines will result in disqualification. Adjudicators: Judges will be selected from the lists from Bands of America, Drum Corps International, and Winter Guard International. These organizations provide extensive numbers management training for their judges. The panel will be selected from all parts of the country in order to obtain the best possible adjudication team. Scoring System: The Bands of America scoring system/sheets will be used for this event. It is the position of Bands of America that music is the more important aspect of the performance, with marching as the presentation and visual enhancement of the program. Similarly, more emphasis has been placed on the effectiveness to the audience and to general effect judges, than on fine-line perfection of the performance judges - which may be an aspect to work on for even better effectiveness. Consequently, the weight of the numbers in the Bands of America scoring system places 60% of the value on music and 40% on visual, and at the same time, 60% of the score is within the area of general effect and 40% within the performance area. For a copy of this system, contact Bands of America at 1-800-848-BAND or visit the BOA web page at www.musicforall.org. In the event of a tie, the high placement will be awarded to the band with the higher raw score (subtotal before penalties). If, after using this criterion a tie still exists, the highest General Effect total will be used to determine placement. This will only be used to determine Class Champions and finals competition. Event Registration/Preliminary Performance Info: The event shall be limited to no more than 26 bands. Entries will be accepted via the online entry form beginning April 5th, 2019 at 8:00 AM CT through August 31, 2019 (or until maximum number of entries has been received). Any entries received prior to April 5th at 8:00 AM CT will not be considered for placement until that date. The defending champion will have the option to perform last in the preliminary competition. Entry deadline is August 31, 2019 or once 26 bands have registered, whichever comes first. Preliminary competition will start no earlier than 9:00 A.M. and band performances will be scheduled at 15-minute intervals. Following the announcement of the class placement awards, the top ten scoring bands, regardless of class, will be announced in random order. The finals competition will be void of any classes. Preliminary class champion performers will be awarded medals at the final awards presentation. In the event that there is only one band entered in a class, only the 1st-place class placement trophy will be presented. No caption awards or champion medals will be presented to that band. That band may, however, opt to compete with bands in a higher class as long as they agree prior to the start of the event. Finals Event Schedule: Immediately following the announcement of the finalist bands, a meeting for the director or representative of each finalist band will be held in a designated area. Finalist performance order will be determined by a top-5, bottom-5 draw. The top 5 scoring bands will draw for the last 5 performance times and the bottom scoring 5 bands will draw for the first 5 performance times. In the event that a "Class Champion" band does not score high enough to place in the finals competition, that band will have the option to perform in the finals event at either the beginning or conclusion of the finals competition. The finals competition will begin at 7:00 p.m.
Finals Awards Presentation: The event will feature a full-band retreat with all finalist bands and Class Champion exhibition bands. Awards will be presented to finalist bands for 1st through 10th, as well as Highest Achievements (same as prelims). At the conclusion of the Finals awards presentation, members will be dismissed to congratulate each other. The champion unit will be offered the option to have the field for a victory performance, once all performers have left the field. Critique: A judges’ critique session will be available immediately following the Finals Awards presentation for those bands that performed in exhibition or as a finalist during the evening. This will be on a first-come, first served, basis and is optional for the aforementioned bands. Spectator Tickets: Tickets are available on-line and will be available at the gate. More information will be included in your director packet which will be e-mailed to you early in October. 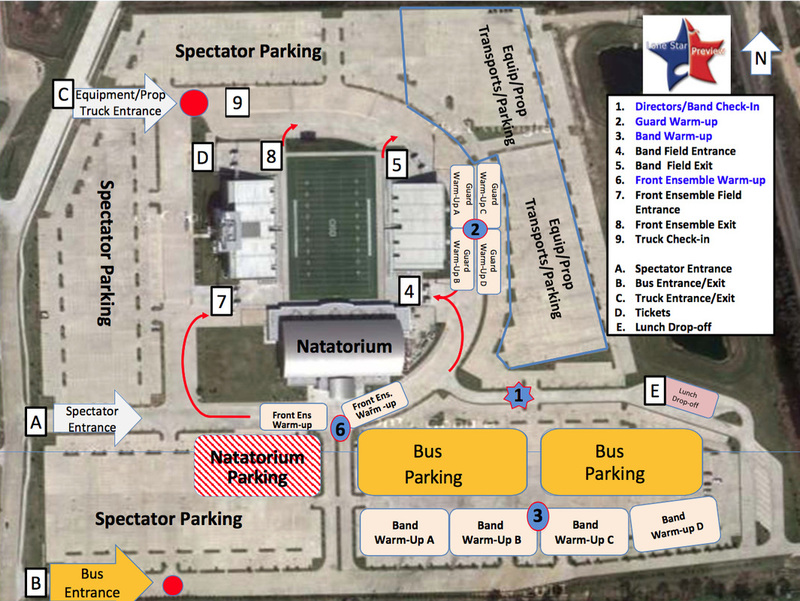 Ticket information will also be available on our website at http://www.twhsband.org/lone-star-preview.html​. Director Badges/Field Passes: Passes for competing bands may be picked up at Director Check-In when your band arrives at the site. Each band will receive six (6) Director badges and twenty-five (25) field passes, regardless of band size. These numbers are to be listed on the Entry Form and will be verified at the competition. Additional passes may be purchased as regular gate admission tickets. These passes will be valid for both prelims and finals competition. Copyright: Any applicable copyright laws for the performance and/or arranging of music for each band's performance are the sole responsibility of each participating unit. Warm Up: Your prelim warm-up times will be included in your final packet which will be mailed in early October. A front ensemble warm-up area will be provided near the stadium. Bands may not practice or warm up within earshot or visual vicinity of the stadium. A physical warm-up area will be provided prior to your scheduled musical warm-up time. Use of the physical warm-up site is optional, but if your band chooses to warm up, it must be in the designated area. Report time to the stadium will be 10 minutes prior to your scheduled performance time. Performance Area Surface (of the stadium floor): The performance field will be a regulation size football field with end zones and including the area from out-of-bounds lines on the ends to fifteen (15) feet in front of the front side line (360 feet long) and from the out-of-bounds lines on the ends to the back limit of the field surface, normally the back grandstand or wall. Entrance of the band proper may not be over the front sideline. Performers presetting equipment in the front (pit) may enter from the front. Performance Times: Once your band enters the performance area, you will have a four (4) minute maximum prep time for set-up and warm-up (placement of props/equipment must take place during this time). This time will begin at the cue of the Timing & Penalties judge. Once your band appears to be ready, or at three (3) minutes and 30 seconds, the announcer will introduce your band. Once the drum majors hear their names, they are to immediately salute and set to begin the performance. The first note of music or the first step-off by a member of the band proper will start the timing of your show and must occur within 30 seconds from the conclusion of the announcement introducing your band. Each band is allowed a performance time of 7 to 11 minutes. This timing will begin at the conclusion of the four (4)-minute set-up/warm-up time. Following completion of your show, your band will have two (2) minutes to vacate the performance area (outside/clear of the goal line), which will be the conclusion of your 15-minute block. All props and equipment must be totally removed from the Performance Area within four (4) minutes following the end of the band’s performance. All uniformed students will receive a hand stamp that will allow them access back into the stadium. Props/Equipment: Your band will be able to unload large props and equipment for your show no sooner than 45 minutes prior to your step-off time. Following your band’s performance, you will have 45 minutes to remove your props and equipment. Specifics will be included in the October packet. Electronics: All electronically produced music must be "live" and played in "real time" by a student. No "prerecorded or sequenced" music, whether instrumental or vocal may be used. The use of sounds other than music, such as narration or sound effects, may be prerecorded and used without penalty. Electronic units are allowed if they are self-powered. If power is available at the site, it may be used at the unit's own risk. Neither The Woodlands High School Band nor the Conroe Independent School District takes responsibility for supplying any band’s electrical and electronic needs.